JoCo. You may not have heard of this county, but anyone who has experienced it carves out a soft spot for it in their heart. 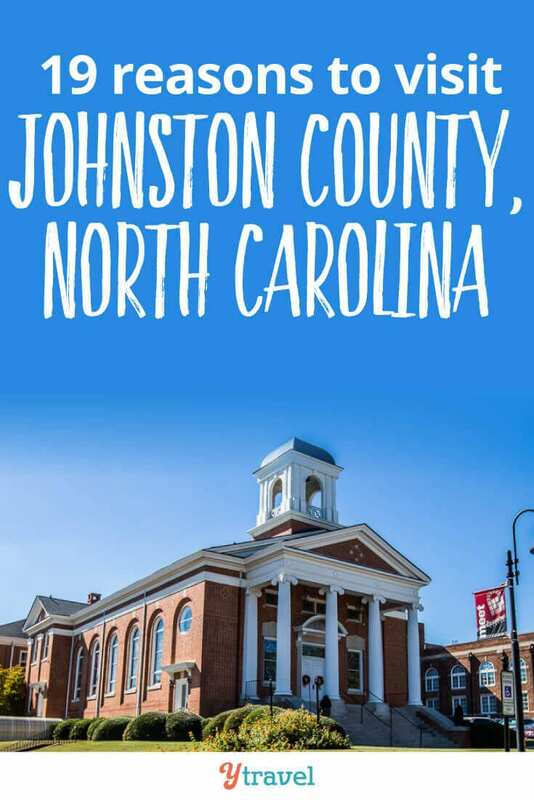 Johnston County, as it’s proper name expands out to, is one of the biggest counties in North Carolina, and the next county south of Raleigh. Its location is important. The I-95 running along the north-south corridor of the country and I-40 running the east-west corridor of the country crosses through JoCo. And its position is halfway between the North Carolina borders and roughly halfway between New York City and Florida. It makes a nice stopping off point on your East Coast road trip. However, you don’t want to make it just a place to grab some fuel and a snack. JoCo is worth stopping in for awhile. Johnston County has a soft spot in my heart. 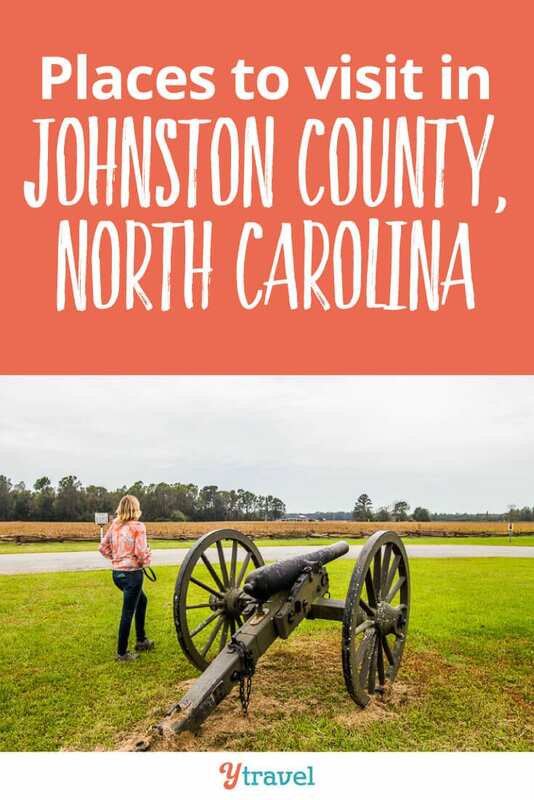 It’s not because we recently visited on a weekend getaway in partnership with Visit Johnston County, but because we wouldn’t have our travel blog, nor received our Green Cards via our blogging business, if it wasn’t in some part for Johnston County! In 2004, I arrived in the US on a teaching exchange program and was placed in the Johnston County Public Schools system (JCPS). The school I was assigned, South Smithfield Elementary, lies in the Southern end of Johnston County. 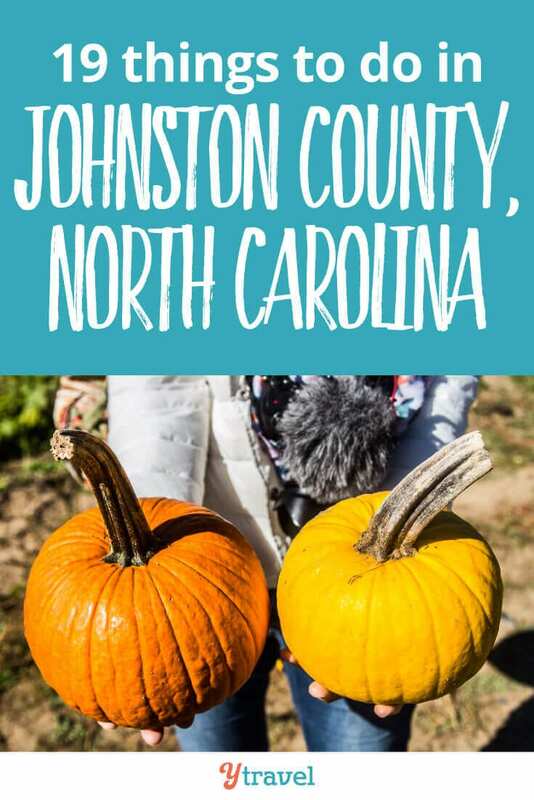 While we chose to live in Raleigh, the city we knew we’d spend our spare time playing in, I spent a lot of time in Johnston County traveling back and forth to work, and mixing with my new JoCo friends. I ended up being a part of the Johnston County schools community for 4 years. I was immediately welcomed in as part of a family, and it was that warmth, curiosity and wonder that I experienced that made me fall in love with life in America. It’s when we knew we wanted to live in America permanently and so started our quest to find a way to do it. And so here we are. We were delighted to visit Johnston County again and share this special place with the world. We never really explored JoCo though the eyes of a traveler so we were excited to see what it had to offer. 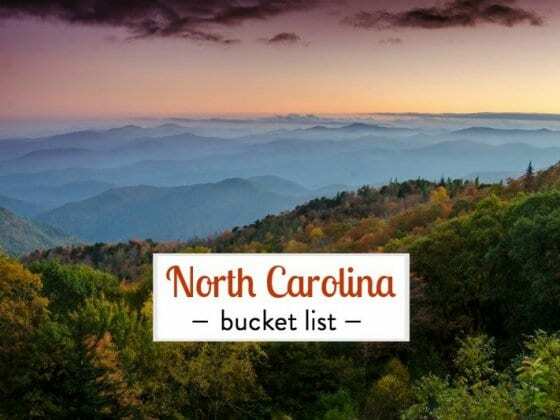 Below are our tips on things to do in Johnston County NC. 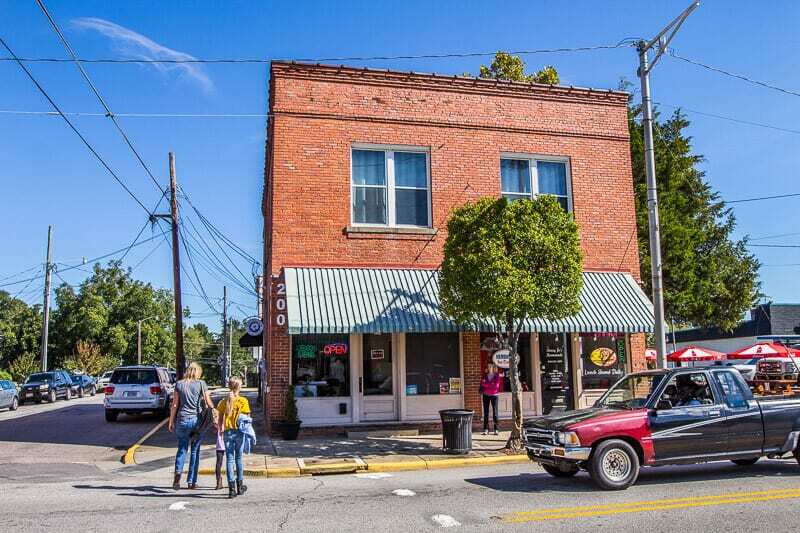 Clayton is a small town community that has been booming with transplants since we moved here in 2014. 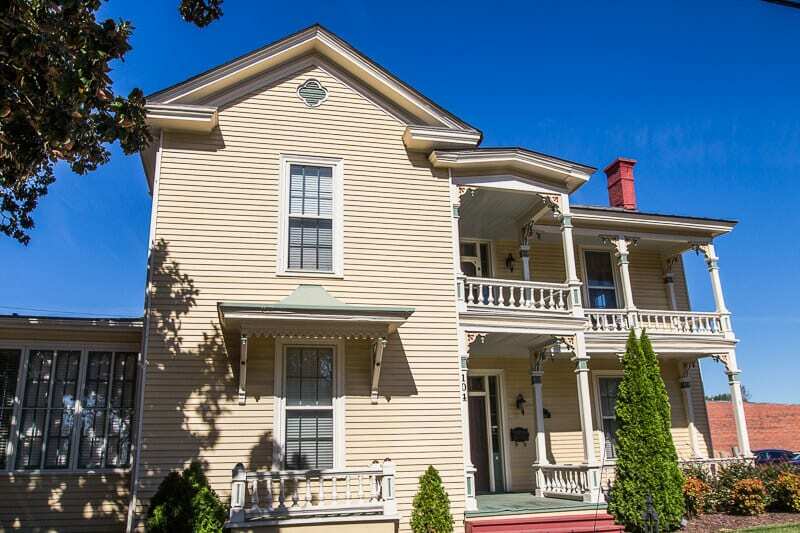 It has a small town community vibe with affordable property that’s approximately a 20-minute drive to downtown Raleigh. 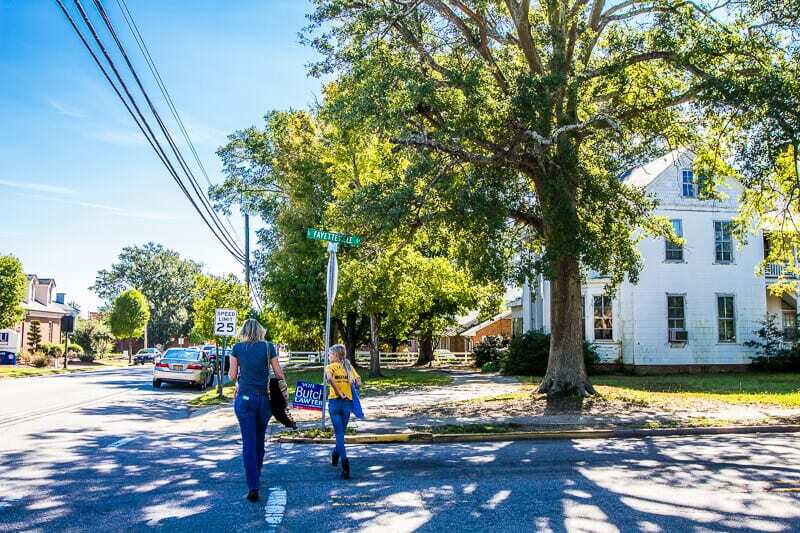 Downtown Clayton is where you’ll find boutique stores, historic buildings, charming southern homes, and hipster cafes and bars with crafty cocktails that bring a healthy balance of champagne, grapefruit and sage. It reminded us a lot of Franklin, Tennessee near Nashville. And if it keeps growing with the same vibe and perhaps start to bring in more local music, it just may be the next Franklin. It’s rare that you find a store that oozes sophistication and style. 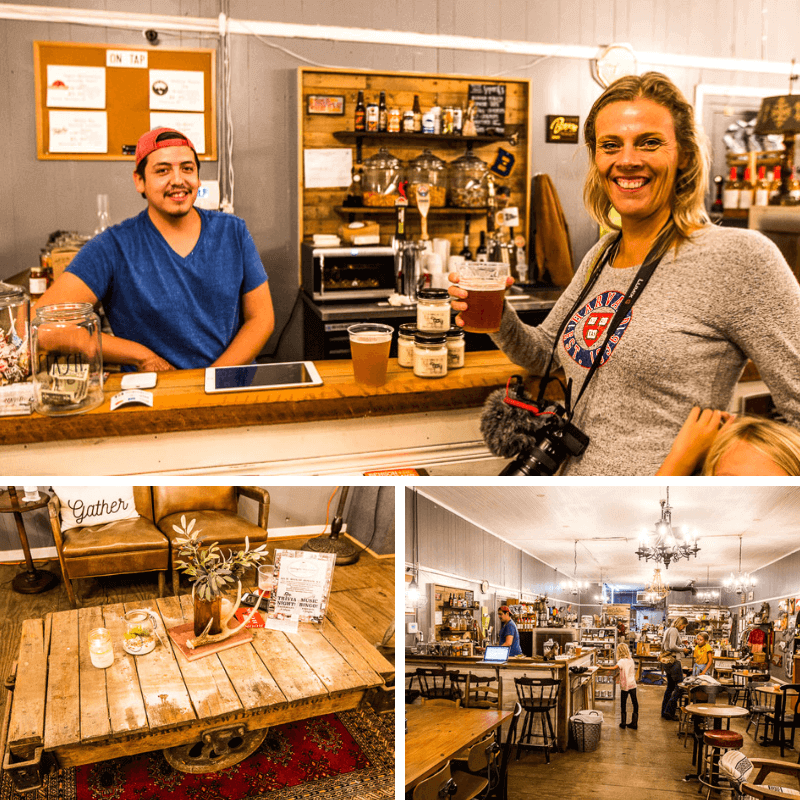 We fell in love with The Market at Three Little Birds in Downtown Clayton. 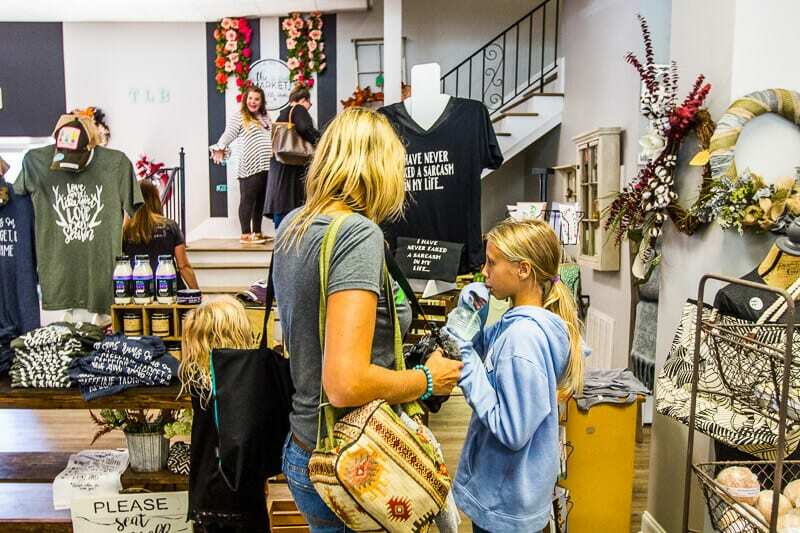 The only other time a store has wowed me like that was Magnolia Market in Waco, and Magpie’s, the children’s boutique store in Franklin, Tennessee. We popped in for a quick look, and nearly an hour later walked out with T-shirts, jewelry, coozies, and a wall hanging to signify our love for our home in NC, and a smaller one to go into our RV. Three Little Birds was started by a local, who gathers together unique, handcrafted items from over 70 local artists. Even the girls loved browsing the three levels of signs, jewelry, clothes, and home furnishings. It’s a space filled with many messages of love and hope, a feeling JoCo gives to all who pass by with words of gratitude and blessings. . 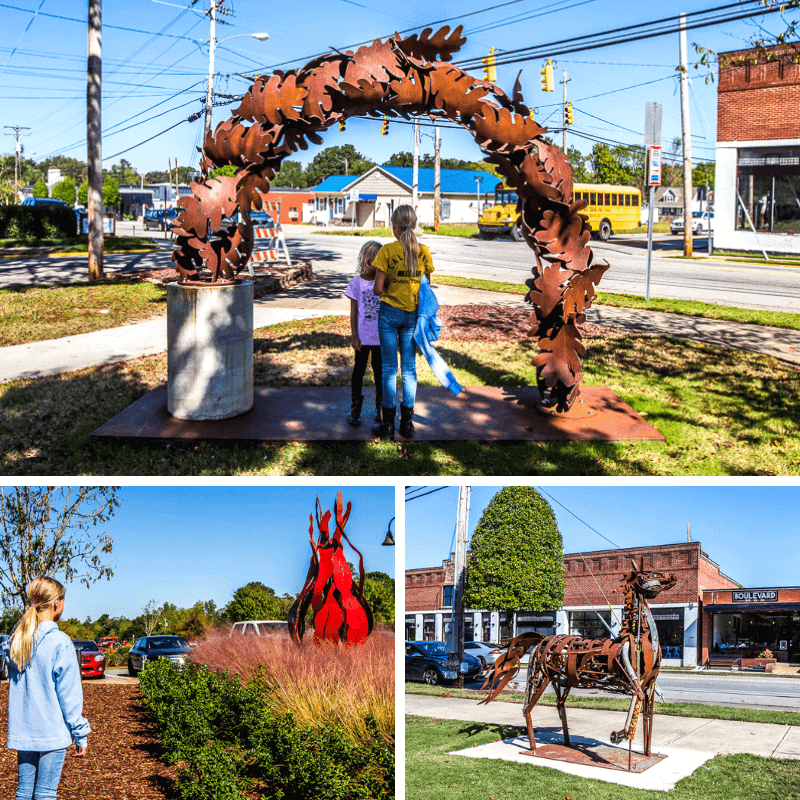 Scattered along Main Street in Downtown Clayton is a self-guided sculptural trail featuring sculptures by local artists that are changed every year. The sculptures along the free, self-guided trail are changed each year. 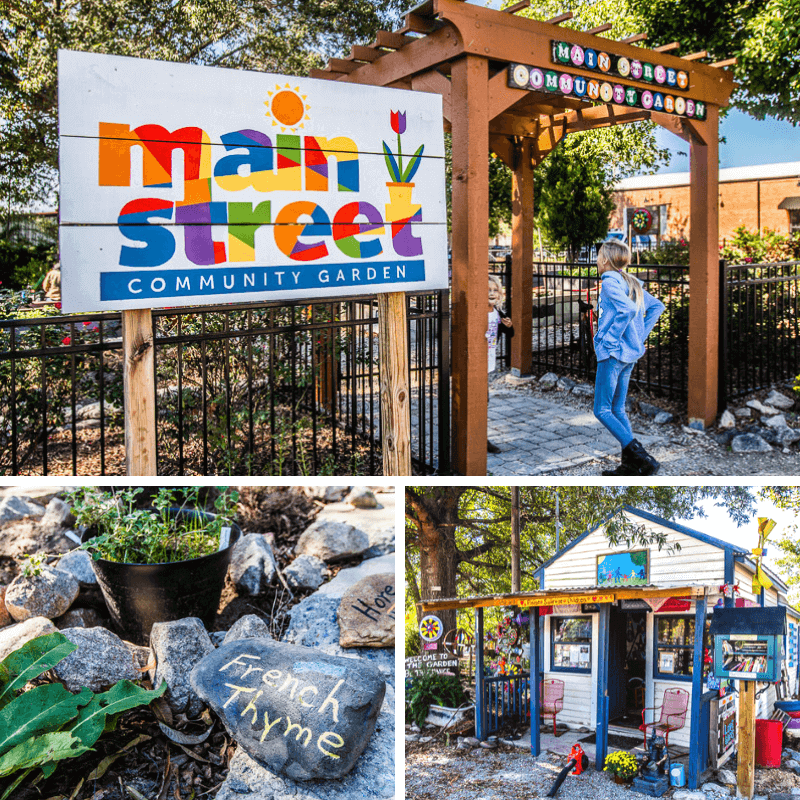 Start at the beautiful art-filled community garden. It’s not just a space you grow your herbs and vegetables. Volunteers help maintain this tranquil, artistic space that offers a bench or two if you want to absorb the moment softly. 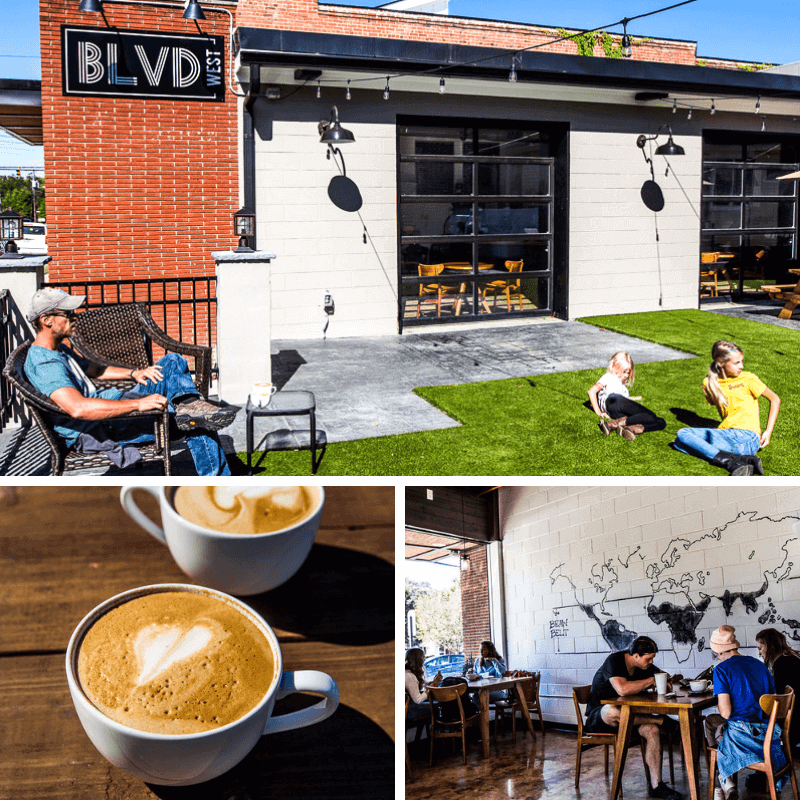 For your hipster café experience, head to Boulevard West where you’ll find locals on their laptops at the bar drinking all manners of coffee concoctions. At night, well even in the day if you please, those coffees switch over to beer and wine. On the day we visited an 80’s concert was happening that night in the park across the road, followed by an 80’s themed party in Boulevard. It was going to be the place to be and we were sad to not throw on our leg warmers and side pony tales to make it after our movie night. Boulevard has a decent cup of coffee and a lovely outdoor seating area with loads of sunshine! What a fun experience this family run farm in Clayton was. 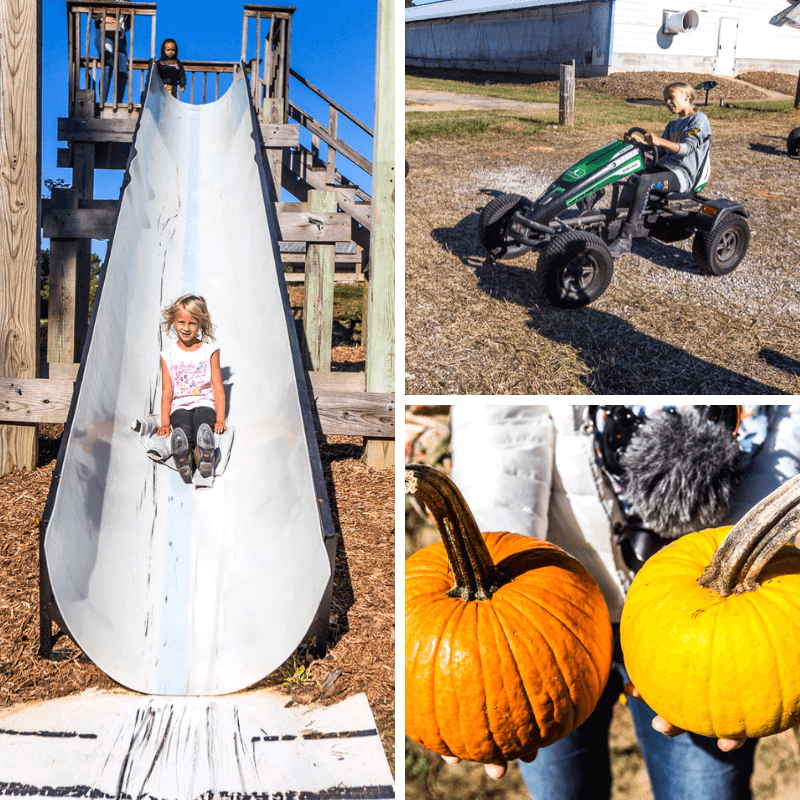 Prepare for more fall fun with pumpkin picking, hay rises, bouncing pillows, slides, wheels, and the House of Dreams with the most incredible painted 3D house I’ve ever experienced. 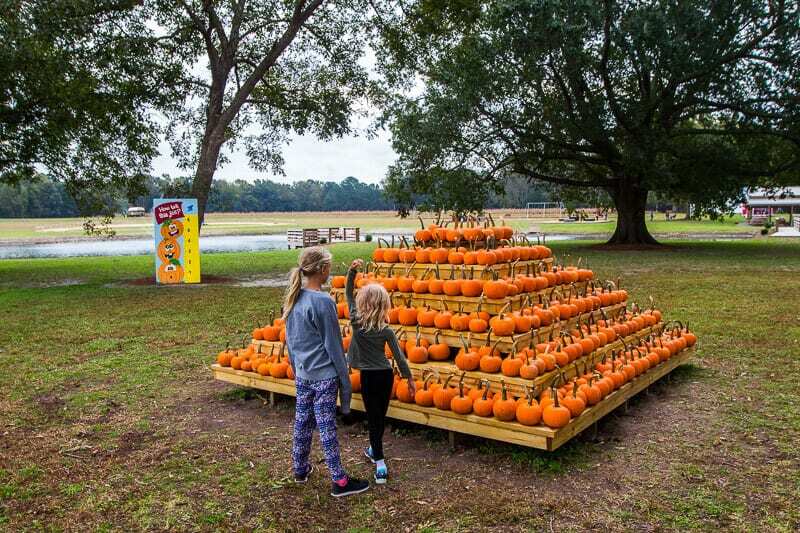 Actually, I’ve never experienced anything like it before and it’s well worth visiting Boyette Farm just to see it. We walked through it the first time completely wowed by the detail in the bright neon paintings that covered every black painted walls of the shed. We had no idea until the end, that it was actually a 3D art experience. We found the glasses, popped them on and walked through again, stunned at how the paintings sprung out from the walls and surrounded us. We were walking through this world of jack in the boxes, tigers, scary clowns and spiders. 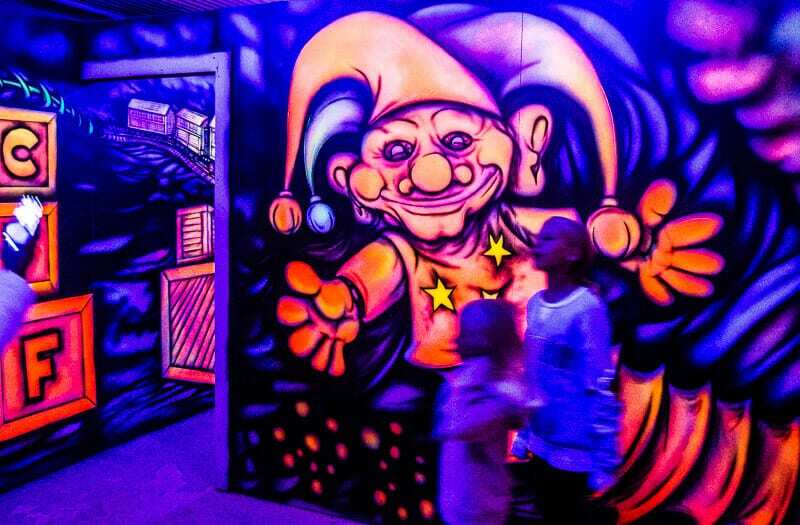 Don’t miss the Fear Farm, the ONLY haunted Halloween scream park in The Triangle area. It features eight scary haunted attractions including the Slaughterhouse and Fear Farm Academy. We didn’t get to experience it, but we got to see the decorations in place for it, and it looks epic fun. Nancy’s Bakery was started out of necessity due to a family health crisis and the need to create money to pay for medical costs. David and his mother began selling cakes at the Raleigh Farmers Market. They still have a store there and now have two other locations in Clayton and Greensboro. Nancy’ Jo’s has been a local’s favorite for many years. Everything is homemade using local products whenever possible. 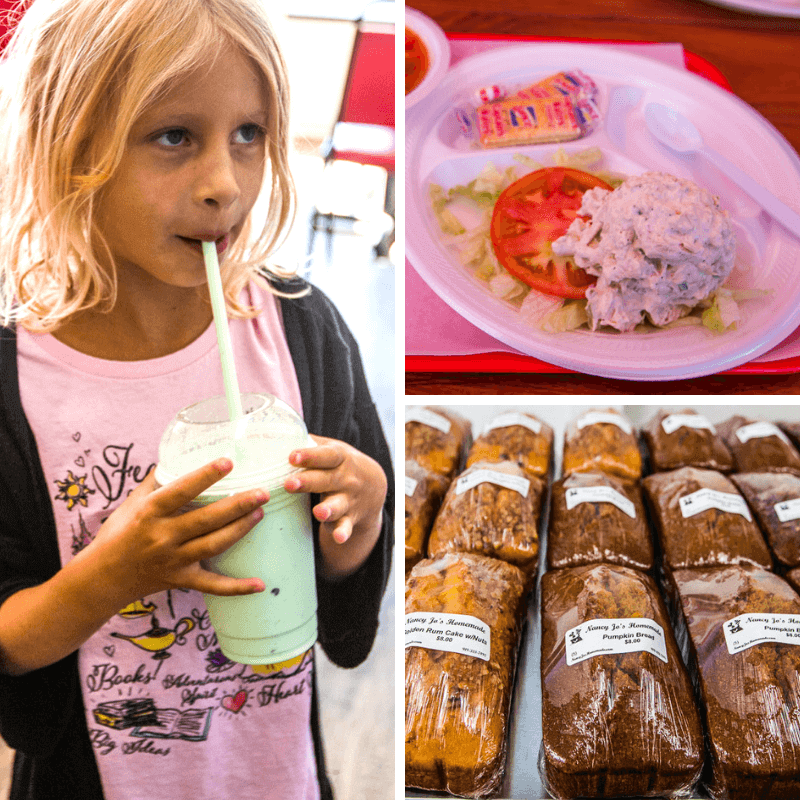 Johnston County is famous for its chicken salad, so don’t pass up the opportunity to have it for lunch. Leave room for an ice cream or milkshake after. Benson is mid-way between New York and Florida at the crossroads of I-95 and I-40. It has a charming downtown and is well known for its annual Benson Mule Days festival. 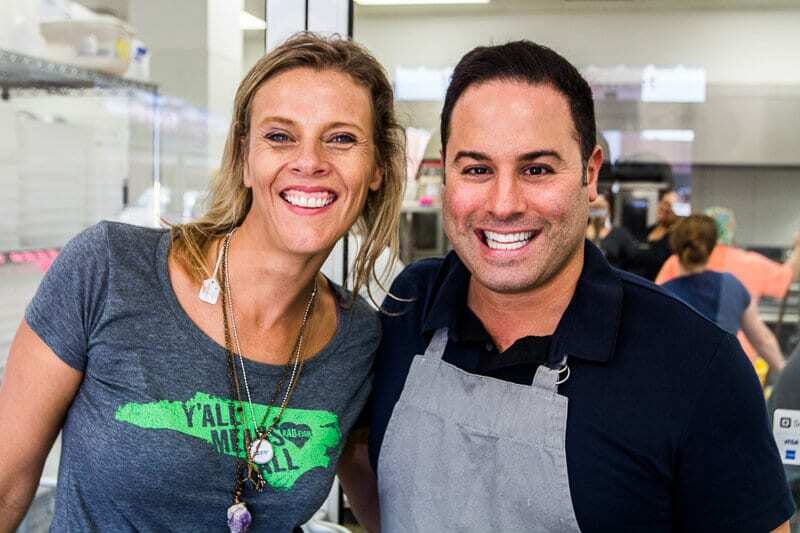 We loved meeting JP and learning more about the business he started due to his own personal health issue with gluten. 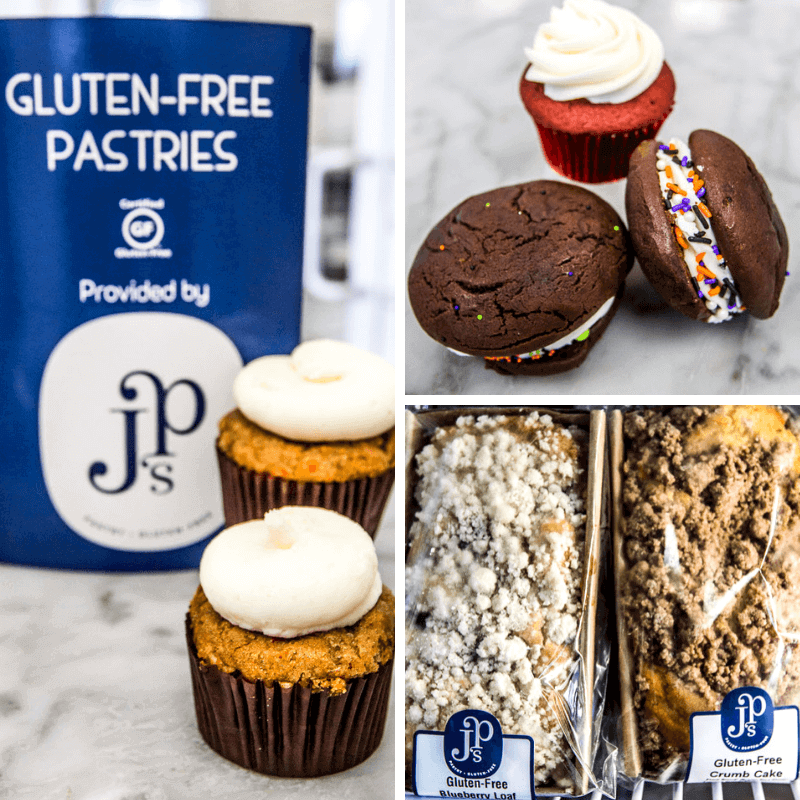 JP’s Pastry is now a thriving bakery business that is the only certified gluten free bakery in North and South Carolina. Yes. A bakery, completely full of gluten free products, and some vegan products. Not only did we love meeting him, BUT we loved eating many of his treats. And I mean many. It’s not often I get to eat a red velvet cupcake, or a pumpkin cheesecake, or an apple blossom, or a brownie. Our kids, who usually refuse to go near anything gluten free I bake couldn’t get enough and requested I learn to cook like that! If you’re passing by the I-95, don’t let JP’s Pastry pass you by. Stop in, have a look at the facilities, stock up on your goodies. He also distributes his goodies throughout the Southeast Region, including many Whole Food stores. See more locations here. 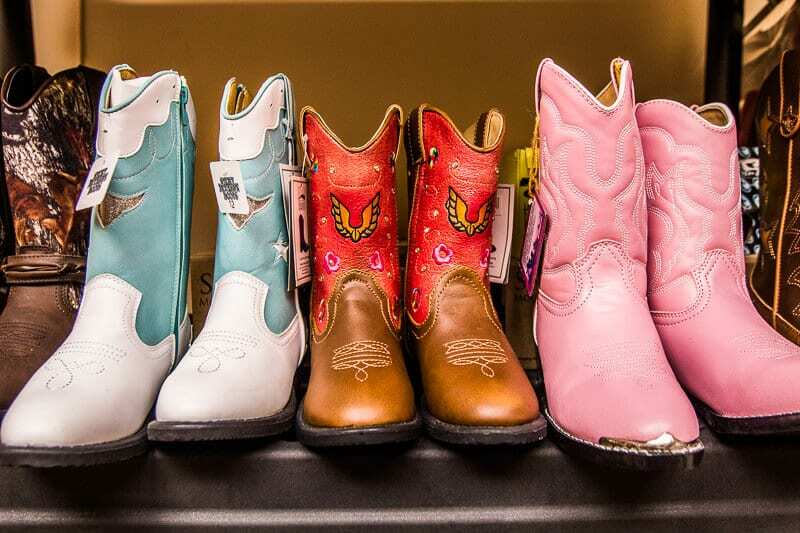 If you love cowgirl or cowboy boots, you don’t want to miss Dixie Divas Boutique in downtown Benson. This was a random find for us as we were wandering down Main Street. The pink sparkly displays beckoned us to step inside and we were greeted as is customary in JoCo with smiles and conversations and an abundance of help. After spending a fortune in cowgirl boots last year in Nashville, I was disappointed I never knew about this place before. It’s so much cheaper and the boots are just as bright and colorful. 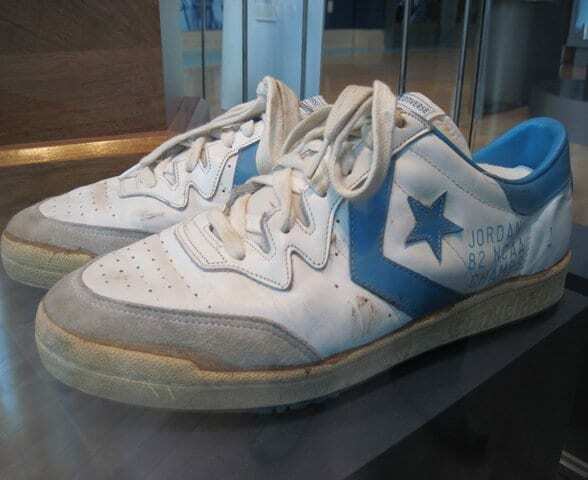 Once the three pairs I have wear out, I’ll be back down to Benson to get my new pair from here. Savannah was enamored with the stylish pair of boots she bought that make a tapping sound whenever she walks. She of course does anything to hear that sound more! Why did I let her get the heeled boots? I can’t pass by a white stucco building that has a craft beer sign pointing me inside. 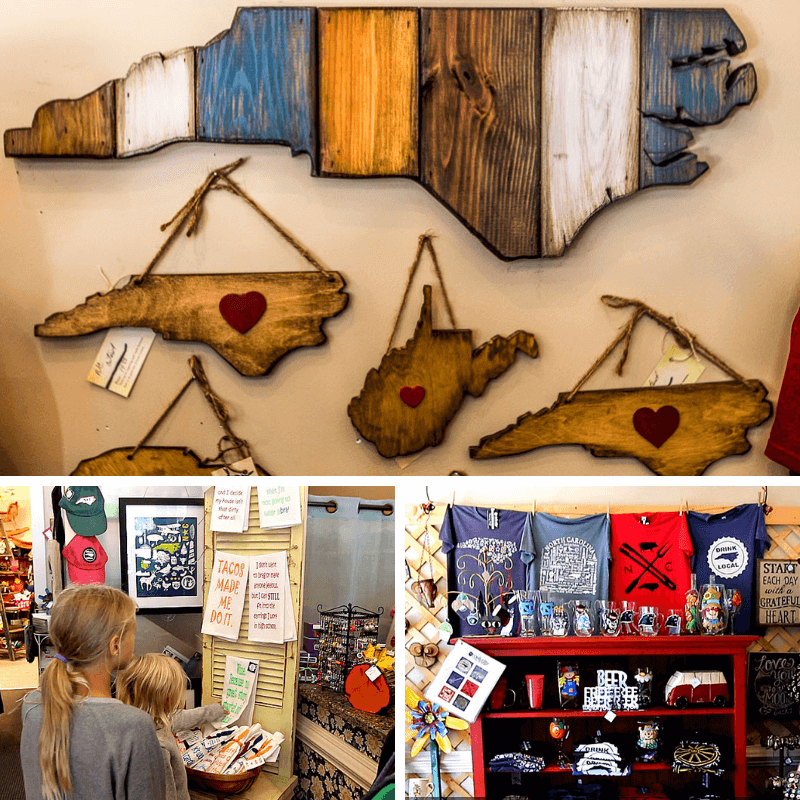 Like the Three Little Birds, Salvaged Heirlooms is an eclectic little general store is filled with local artists that remind you of the warmth of NC and the greatness of yourself. Grab a locally brewed beer as you wander the store to find your next Western style shirt, your vinyl record, a fragrant soy candle, a vintage book of Aesop’s Fables, or some Day of the Dead style artistic coasters. We chatted with him for some time about his life and how he returned to his home of Benson after a brief stint in California. 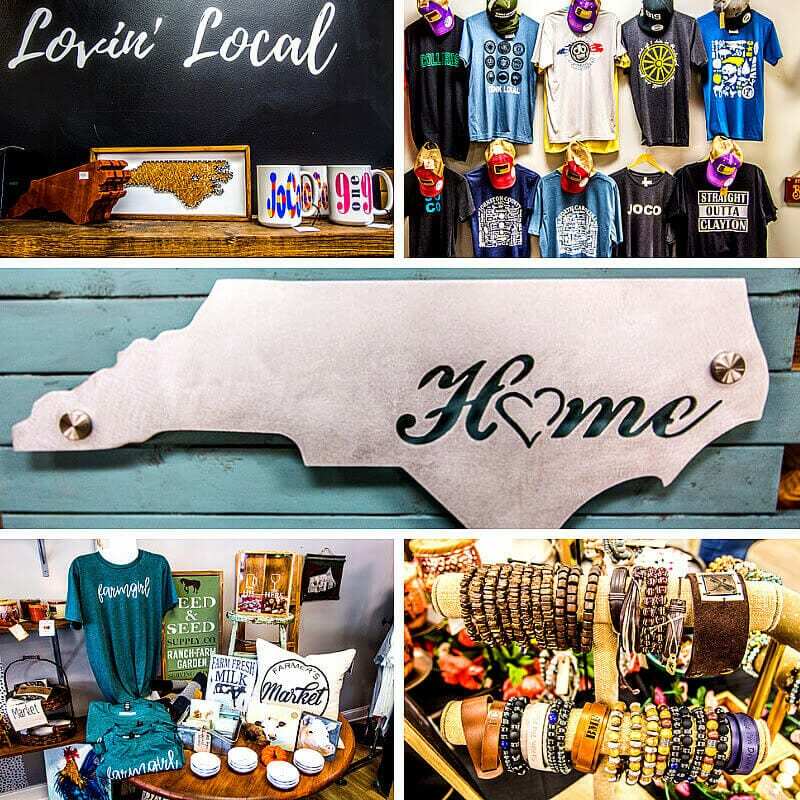 So he picked up his dreams and ideas and started the store in downtown Benson to give locals a cool place to hang out in, similar to the places he was seeing popping up everywhere in Raleigh. Why should the people of Benson miss out on so many cool NC craft beer offerings? So here we stood at the bar at the front of the store drinking an Avocado Toast Ale made from Bombshell Brewery 40 minutes down the road in Holly Springs, the first female only brewery in NC. Although the name sounds strange, the taste was light and refreshing. 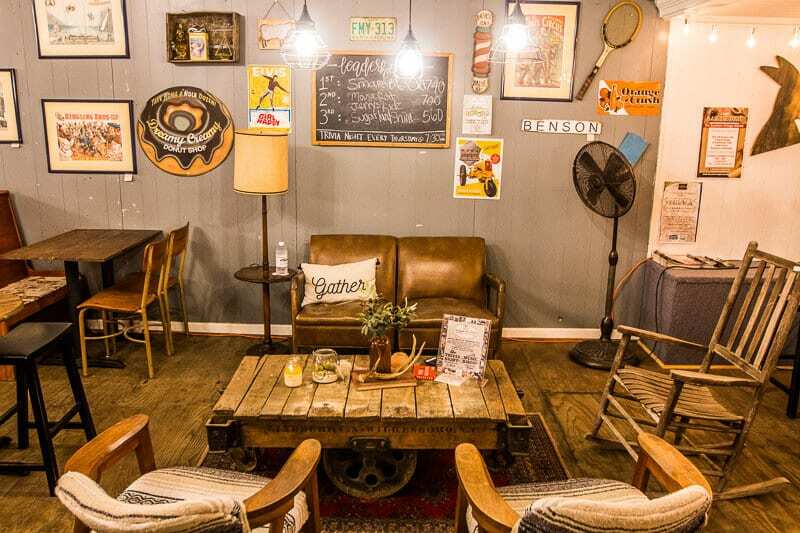 Salvaged Heirlooms also hosts cool community weekly gatherings like musical bingo. I love the creative innovation the youth can bring. 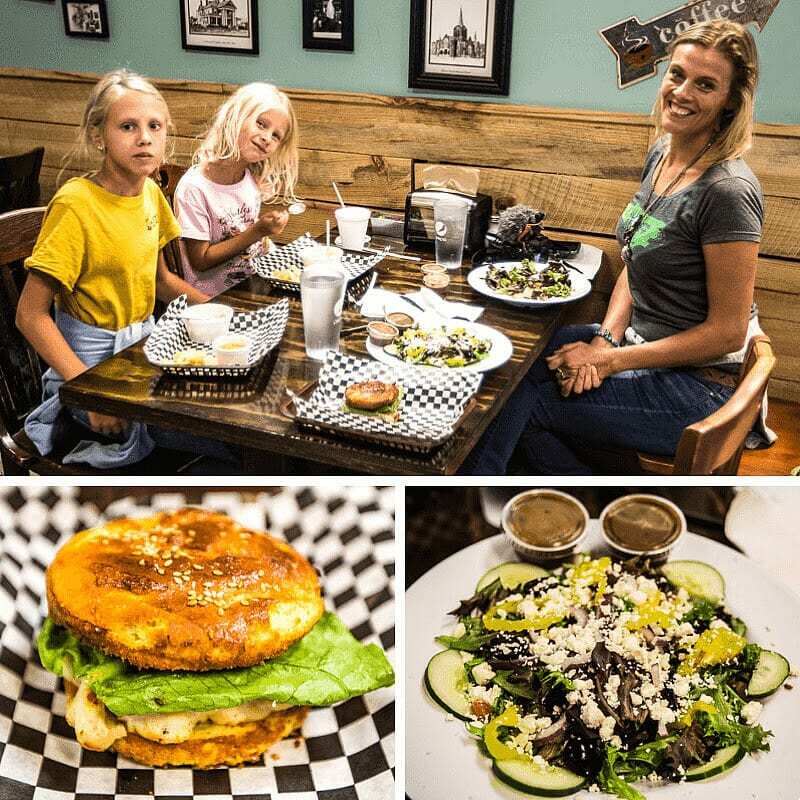 Cornerstone Cafe and Coffee is a family run café in Benson that has the typical JoCo welcoming community atmosphere. Service is warm and polite and the food is fresh and homemade. It brought back the old familiar warmth of lunch dates with my teacher friends on our teacher workday. My chicken spring salad with mandarins, feta cheese, cranberries and toasted pecans was fresh and delicious. 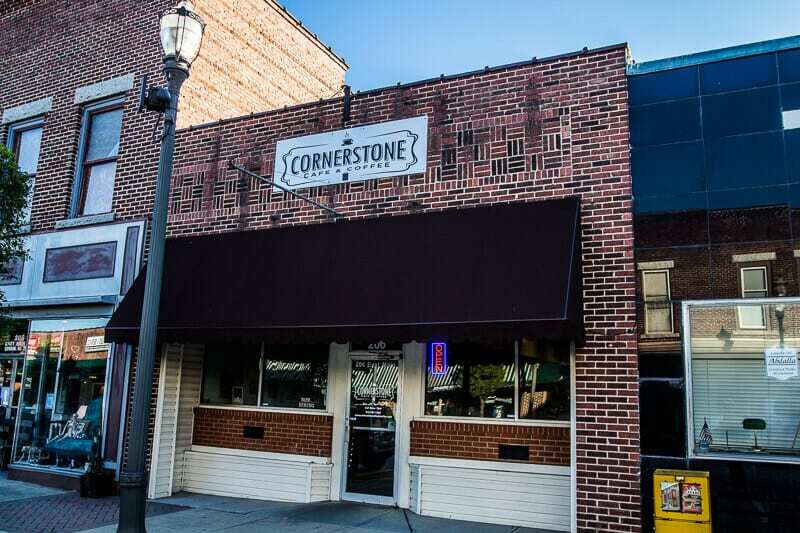 Cornerstone is well known for its waffles at any time of the day, its mac & cheese and grilled cheese sandwiches. We also grabbed a coffee on the run in the mornings which was good. It’s hard to believe a business that’s been around for just over a year could have won so many awards, including a fourth place in the very prestigious Kansas City BBQ Society. 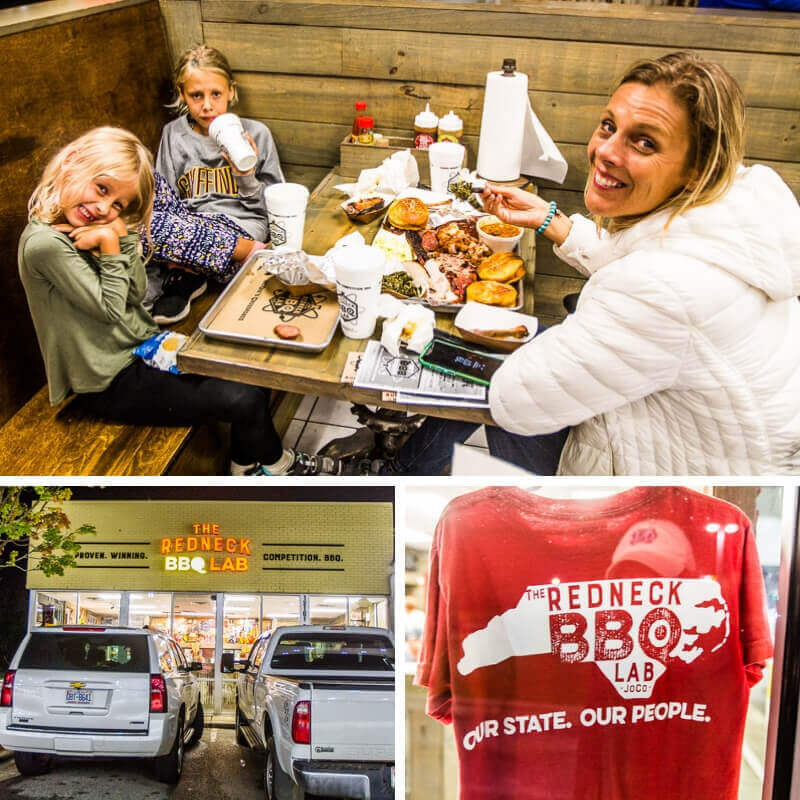 All BBQ meats are smoked on the property at Redneck BBQ Lab and nothing is grilled or fried. We had a massive platter of meats to sample, and boy were they all delicious. Our favorite were the St Louis Ribs. The meat slipped off the bone and and was so tender and delicious with the sweet BBQ sauce. Kalyra called Yummy Yum Yum. We’re usually not big meat eaters, but this was a place we were happy to get our monthly fix from. 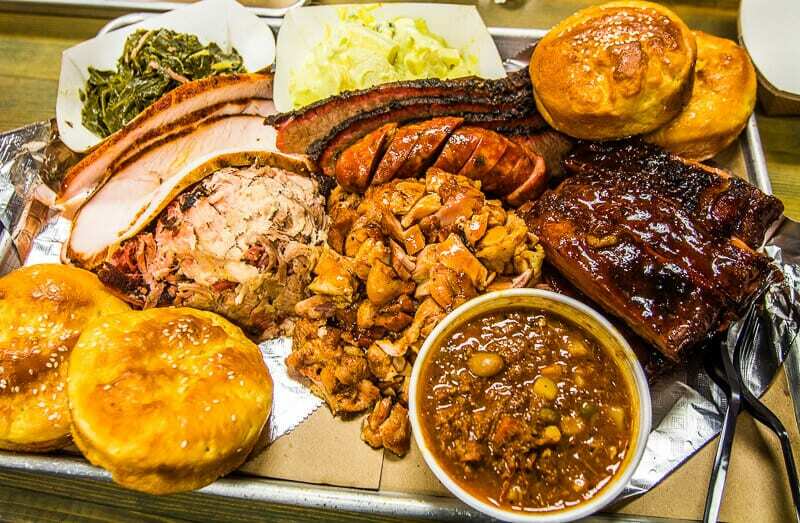 Do not miss the ribs, the Brunswick stew, and BBQ pork, which is the way the Carolinas like to do BBQ. The Burnt Ends are hugely popular and only sold on Tuesdays, Thursdays and Saturdays. 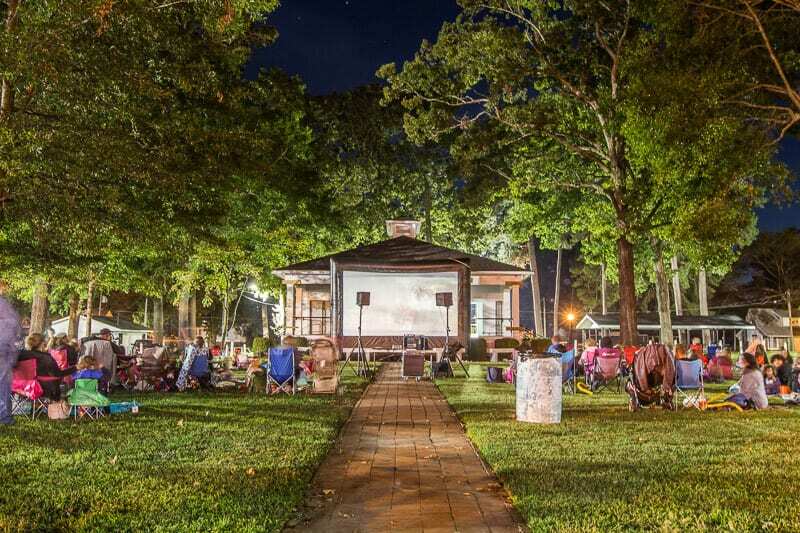 We were fortunate to time our visit with Benson’s monthly movie night. The Singing Grove is the town’s park, which also holds celebrations for Benson Mule Days and the Benson State Singing Convention. We grabbed our picnic blankets and a free bucket of popcorn and snuggled down to watch Coco. It was my first time seeing it, and I loved it. It was a wonderful way to end our day exploring JoCo together. Simplicity giving families cherished memories. 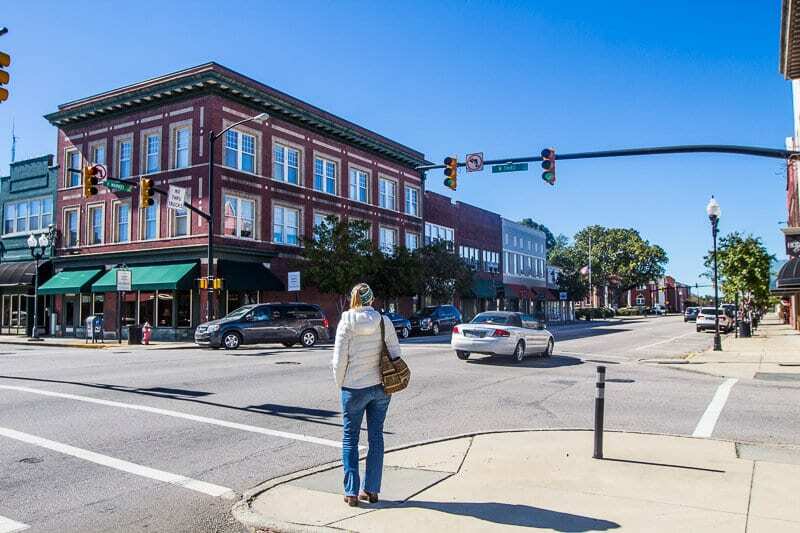 Smithfield is situated along the Neuse River, and is the seat of the county and the hub of business activity. It’s also the town where I taught for three years so I know the community quite well. Seven million visitors enjoy the savings at Carolina Premium Outlets every year. So while you are popping in to shop while you drop, be sure to visit these places. Ava Gardner was known as the most beautiful movie star of her time in the 40’s and 50’s. She starred in numerous Hollywood movies alongside leading men such as Gregory Peck, Clark Gable and Grace Kelly. She was also, for a short time, married to ‘Ole Blue Eyes’. Yes the Legend Frank Sinatra. They are said to be the loves of each others lives, but they just could not live with each other and so sadly their marriage ended. 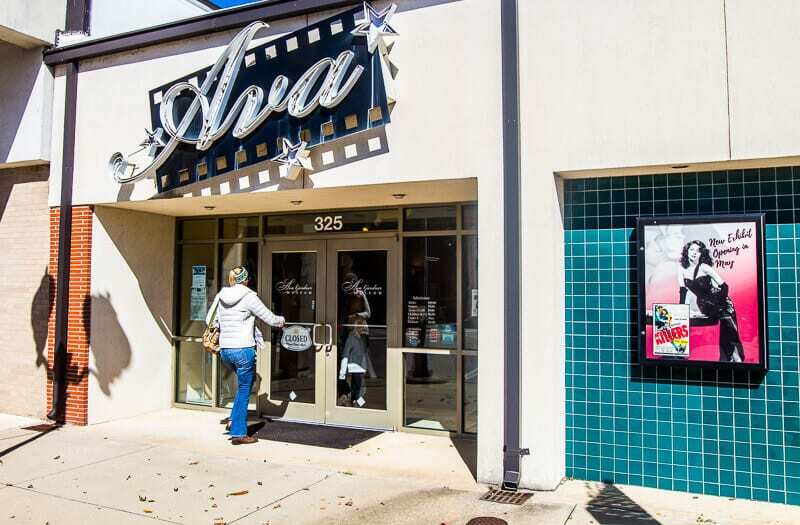 Ava Gardner was from Johnston County and there is a museum on Downtown Smithfield dedicated to telling the story of her life, loves and careers. It’s hard to believe that I taught a few blocks away and never visited, although I definitely heard a lot about Ava from the proud locals who claim the beauty as one of theirs. I thoroughly enjoyed learning more about her. 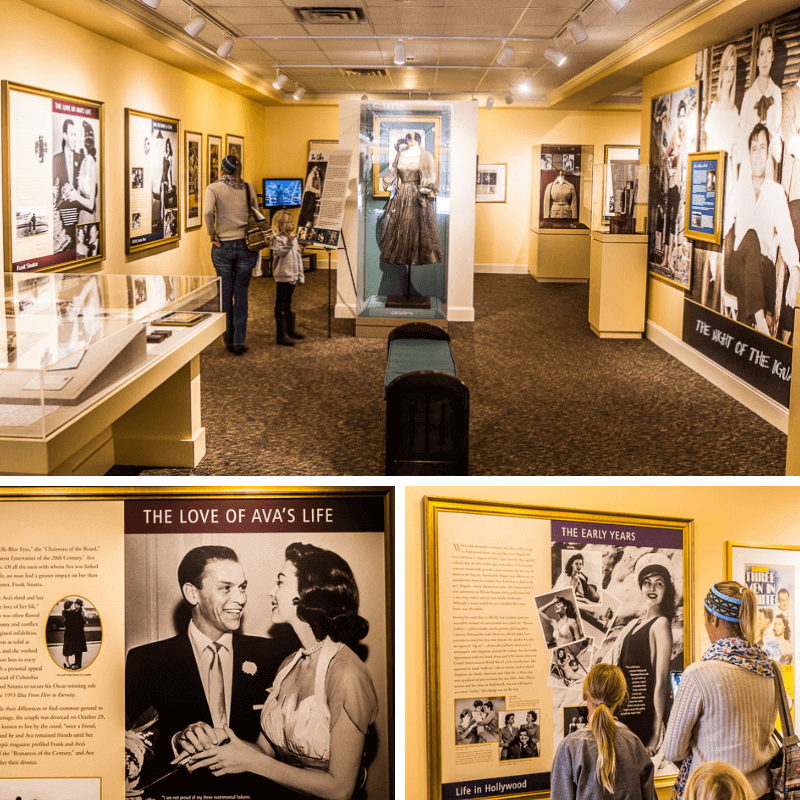 The Ava Gardner Museum starts with a short film sharing her life and within the museum are displays showcasing movie posters, costumes, scripts and personal effects. I loved reading the letter to her handwritten by Princess Grace who was her friend. It was an intimate reminder that celebrities are just normal people too. There is a Scavenger hunt the kids can do to find out more about Ava. I liked this touch and the girls enjoyed doing it. Savannah was enamored with the beauty! For a twist of Southern and American food made from fresh, locally sourced produce don’t miss Simple Twist on Main Street, Smithfield. 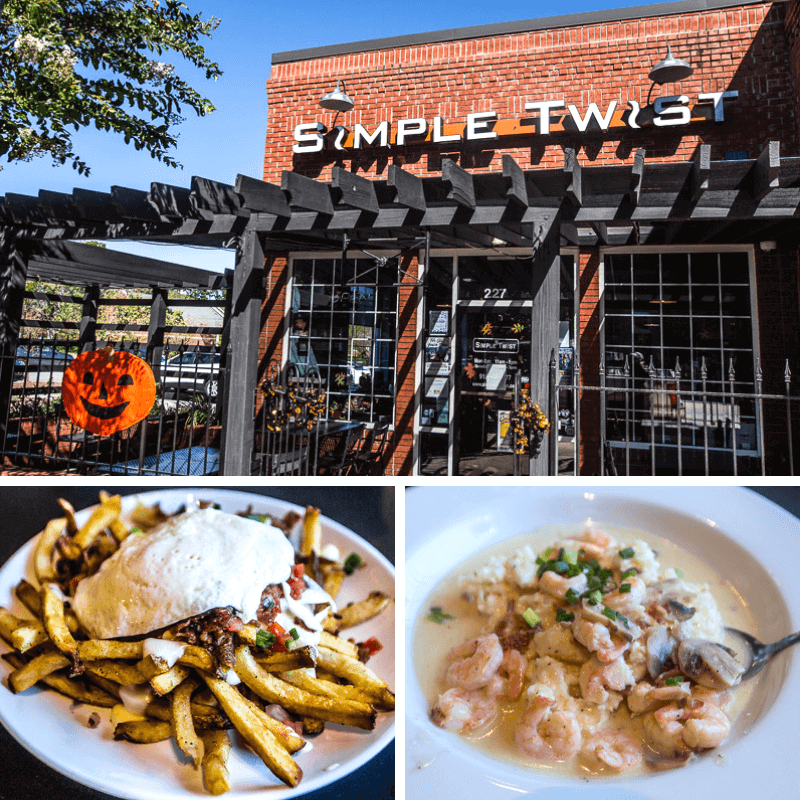 Simple Twist is one of the most popular restaurants in Smithfield NC. It began with one idea for a restaurant and has now grown to three Simple Twist locations and a bottle shop and tap room serving beer from JoCo and NC craft breweries. We ate Sunday brunch, and enjoyed a delicious simple twist of Southern shrimp and grits. You can always pair yours with a mimosa. Again, we popped into this small store in Smithfield for a quick look and walked out with a bag of goodies for home. Like Salvaged Heirloom and Three Little Birds, Oak City Collection is filled with local artist’s creations of signs, T-Shirts and jewelry. We walked out with something from all three categories! We love to support local businesses when we travel. We also picked up a bag of New Orleans style chicory coffee as the owner is originally from New Orleans and the coffee is just like his Dad liked it! 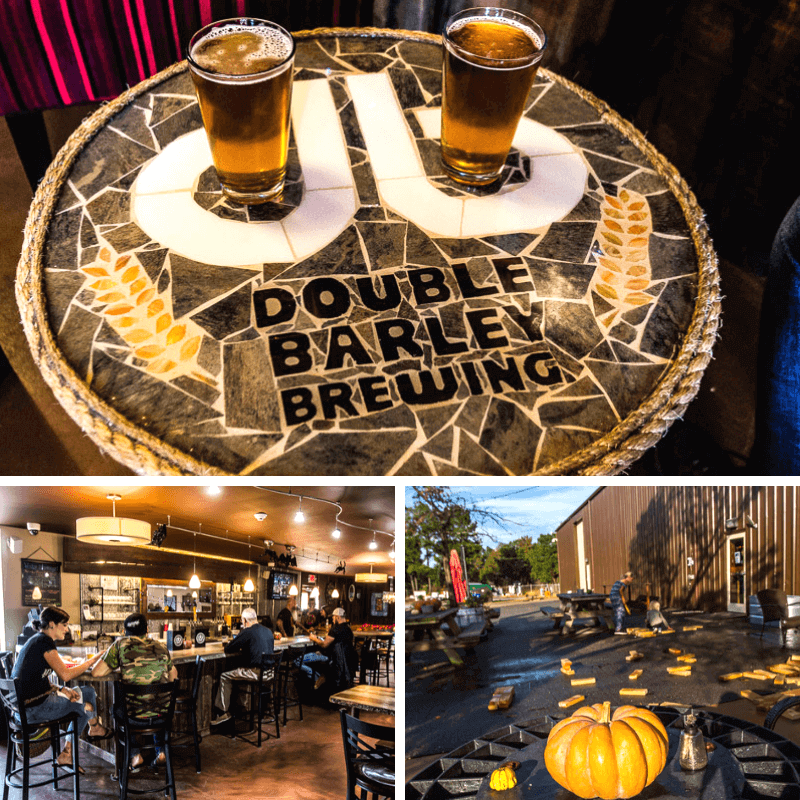 If you’re looking for local craft brew, head to Double Barley Brewery in Smithfield. It’s been opened for five years and has won multiple awards for their beers. Touche is an award winning IPA that we sampled. This brewery is family-friendly with an outdoor seating area and a giant game of jenga. They also do appetizers and sandwiches so if you’re looking for other places to eat in Smithfield NC, who have live music on various days throughout the week, consider here. 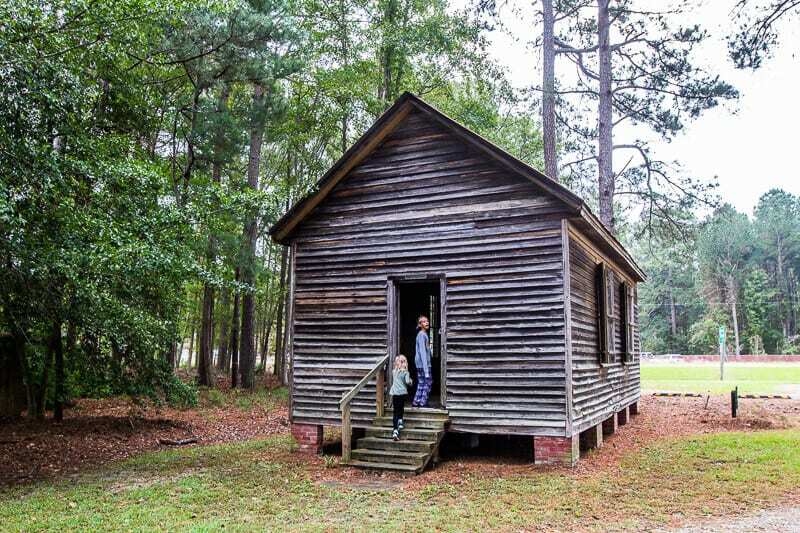 The largest Civil War battle happened near Bentonville in Johnston County. It was also the last full-scale action of the Civil War in which a Confederate army was able to mount a tactical offensive. The Bentonville Battlefield is now an historic site and part of the Civil War Trail. 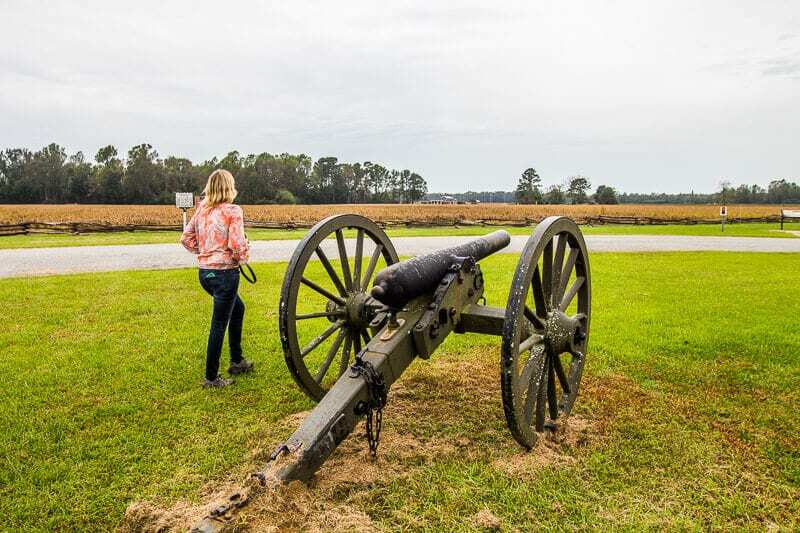 You can do self-guided auto tours, or guided tours, of the area and there is an app, which will tell you the significance of each spot, including the confederate and union army lines and General Sherman’s headquarters. Every five years, 5,000 reenactors descend upon the battlefield for an epic reenactment of the famous battle. The next one will be held March 20-22, 2020. It’s something I definitely want to experience. Learn more about it here. The Bentonville Fall Festival was on while we visited. Interactive guides were dressed in Civil War period costume and told us about things like farming, medicine and Morse code. There were wagon rides and games set up like 19th Century baseball, pumpkin tic tac toe and ring toss, which the girls loved. 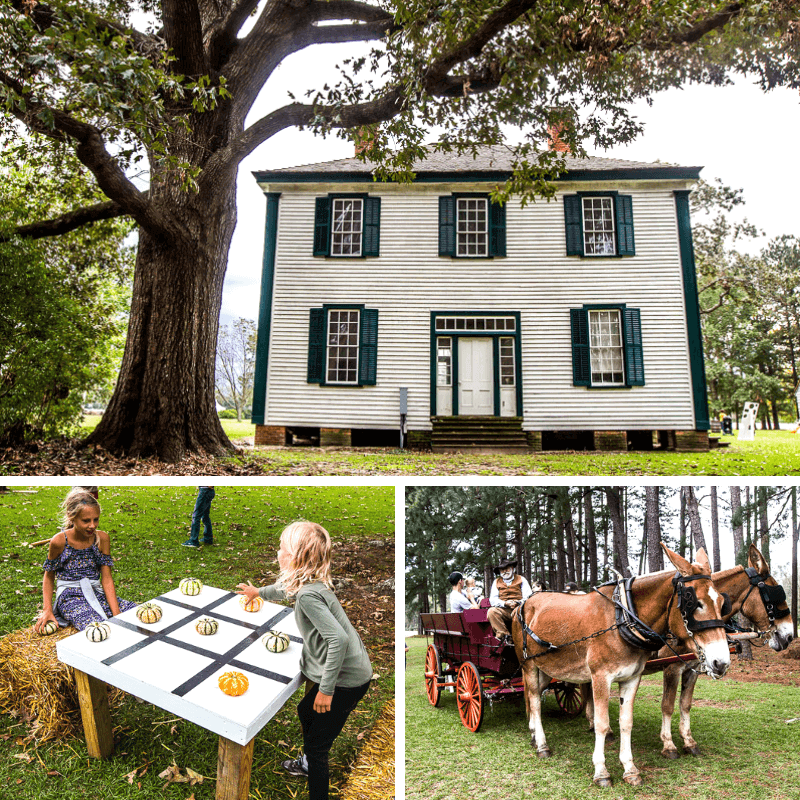 Kenly is on the northeastern edge of Johnston County and has a proud farming history which you will see in the attractions on offer. 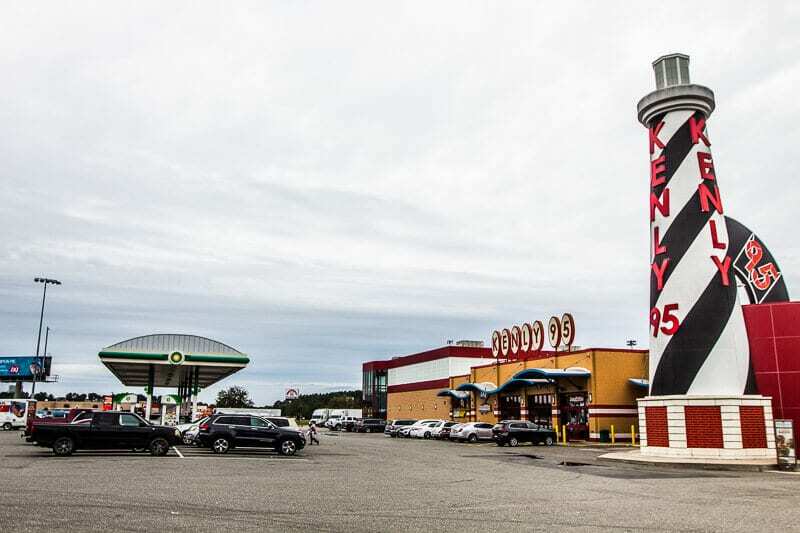 The Kenly 95 Petro is a bit of an institution. Situated on the I-95, it’s a popular place for passing travelers to restock, and truckers to rest awhile (actually, 4,000 people pass through today). This is the kind of place we’ll be looking for on our upcoming US road trip. It has fuel, restaurants, retail, showers, laundry facilities and even a fitness center. But, it’s not just that, they often have concerts and festivals at the Petro. If you are a truck fanatic then you’ll love the memorabilia within the retail space. Agribusiness is the number 1 industry in the North Carolina brings in $84 billion each year, and many of those farms can be found in Johnston County. 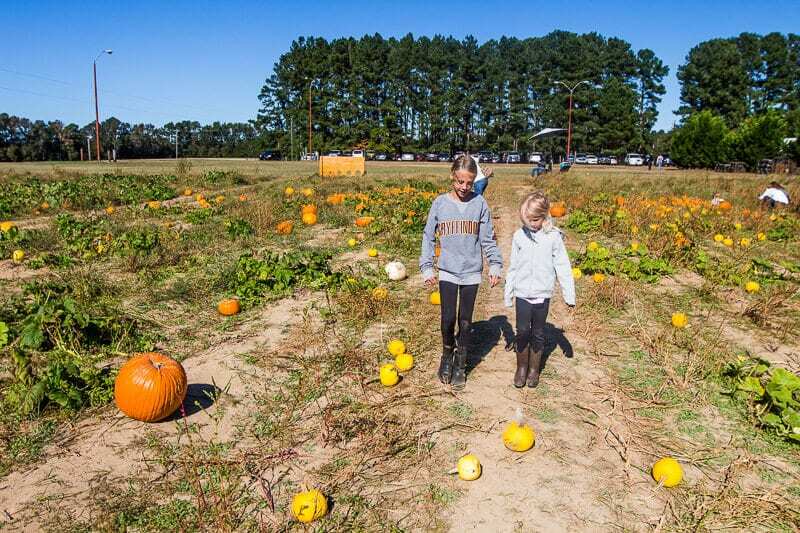 Fall is the season when many farms open up to the public for Fall fun. 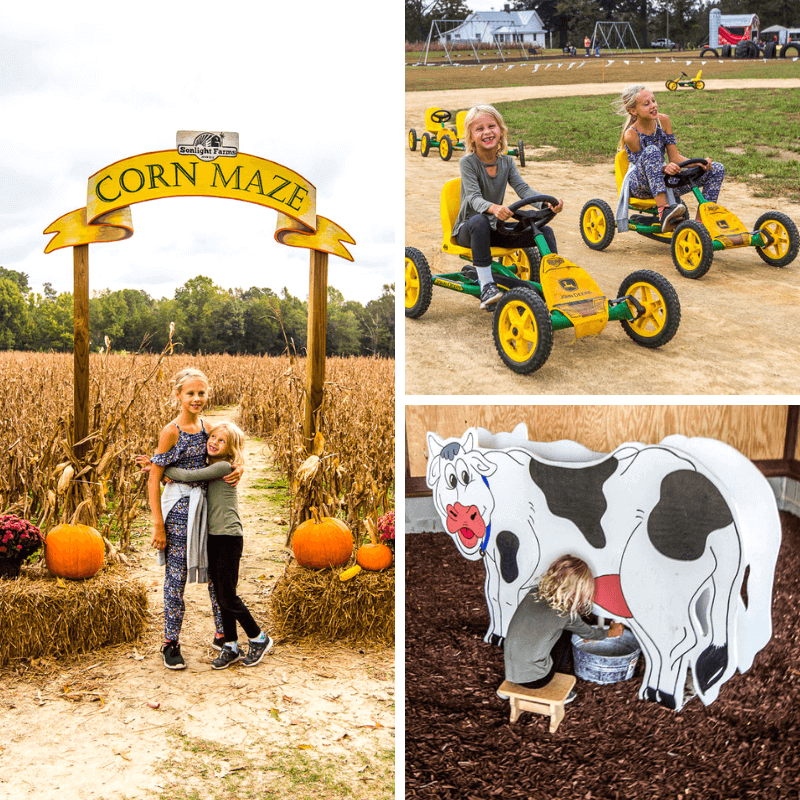 Sonlight Farms offers activities like corn mazes, tractor rides, and pumpkin picking and games like corn hole, pedal kart racing, and bouncing castles. Our girls loved the corn crib at Sonlight farm, and we couldn’t find our way out of their corn maze either!! We were able to take a pumpkin home with us, and someone in our Instagram community gave us a great idea to write things we are grateful for on the pumpkin. I’m grateful to be spending time together as a family and supporting the local JoCo community. 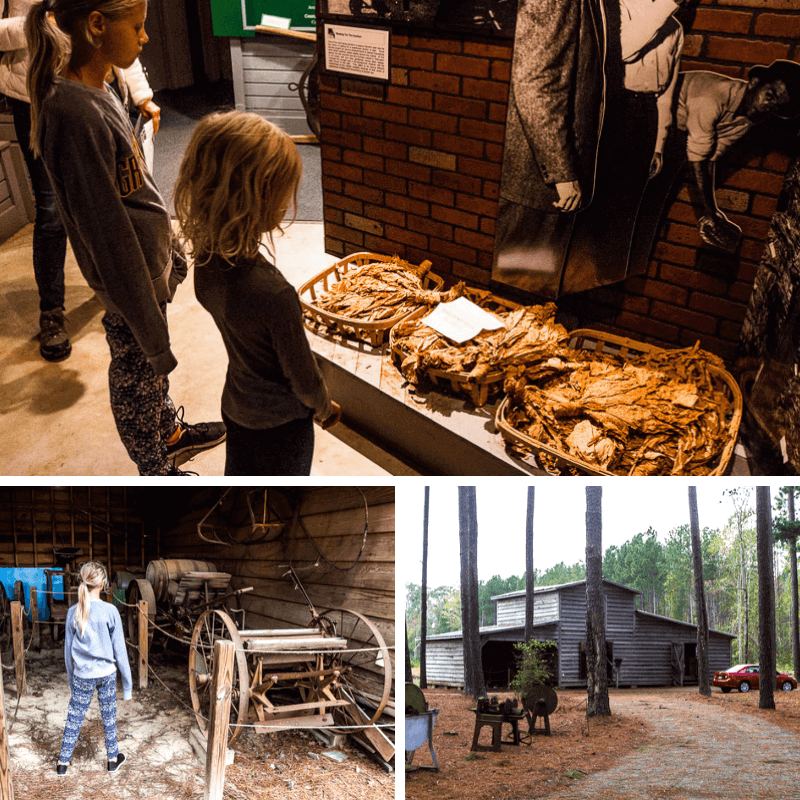 The Tobacco Farm Life Museum gives you an insight into diverse history of the North Carolina family farm. Tobacco farming sprung up when the colonists realized they could earn quite a bit of money selling it to Europeans. The government had to put limits on how much could be grown as farmers began to turn away from other important crops like food to keep the colony thriving. Our trip to the Museum began with a short, yet interesting, video describing the growing process for tobacco (very long and cumbersome process). The Museum gallery also has several displays and exhibits describing tobacco production and life in the rural Johnston County communities. The outside museum space is the Brown Farmstead including a smokehouse, detached kitchen and restored house. All buildings except for the pack house and blacksmith shop are 100 years old and show the typical family farmstead of the early twentieth century. 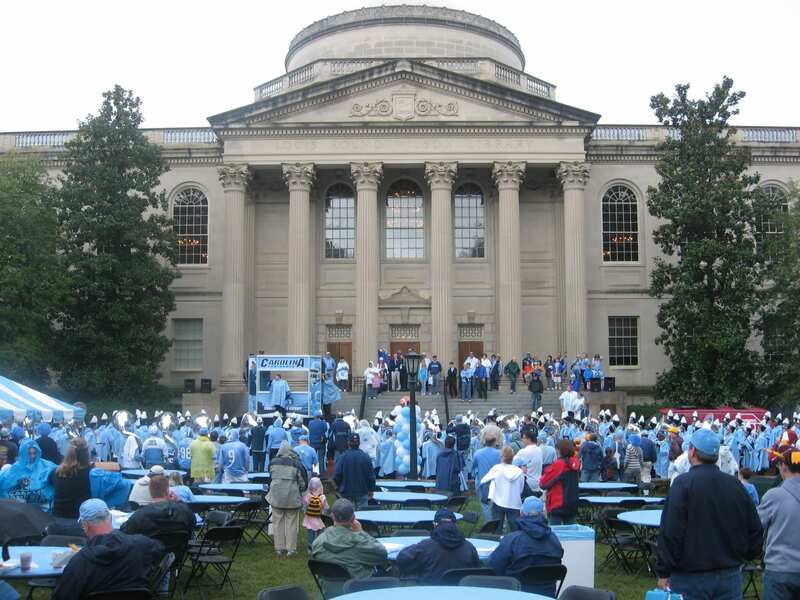 You can wander around the grounds and buildings, and they have different events and classes year round – a quilt painting class was happening in one of the buildings when we visited. 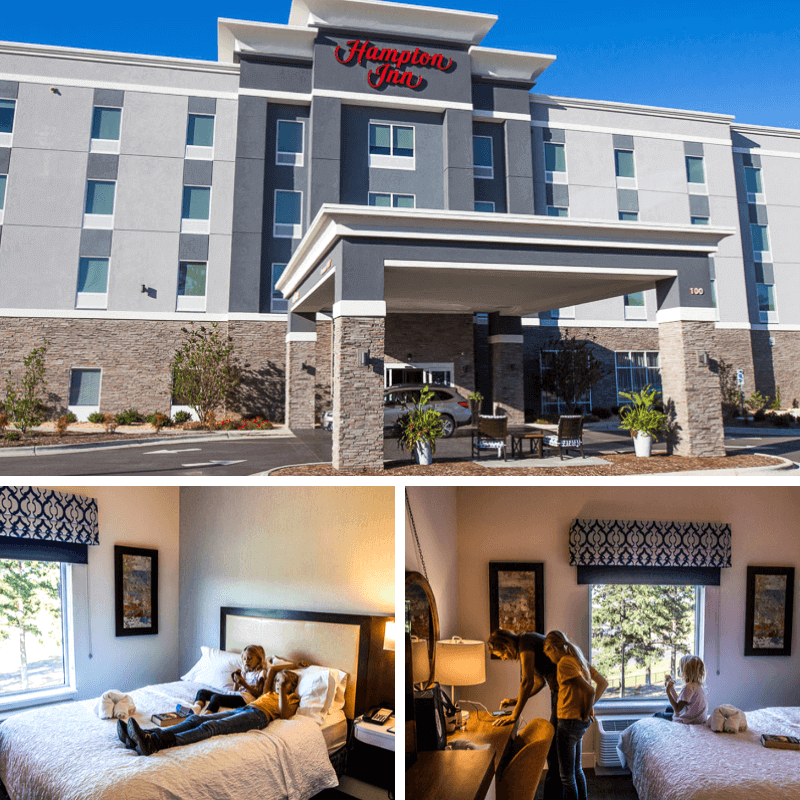 We stayed at the very new Hampton Inn at Benson, which sits right on I-95 and a short drive to downtown Benson. The rooms were very comfortable with modern style and amenities. Breakfast is included and the fitness center had enough to keep your workout routine working! The town of Benson NC is quite a central location to get to the main areas of Johnston County. If you’re looking for other hotels in Johnston County, go here. I didn’t realize how much I missed that rural Southern charm until this visit to Johnston County. People have time to give you here. To ask you a little about your story if you’re a stranger, or ask how your loved ones are doing if you’re a friend. It’s a county that’s full of grace, good manners, and gentle living. Don’t Pass JoCo by! Hello I’m from Brazil. What a beautiful city, it seems from the inside, but modern and organized. Here in Brazil, these little towns are very different. I loved the pictures! congratulations!